Discover the insights, tools, and workshopping you need to be a confident, enthusiastic, efficient, and effective executive leader. Next event in Las Vegas, Fri/Sat September 14-15, 2018. 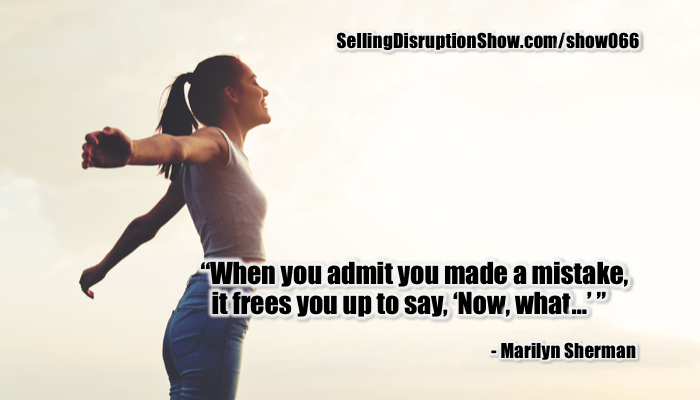 Mark S A Smith: My guest today is Marilyn Sherman who for the past 26 years has helped people create a disruptive mindset. 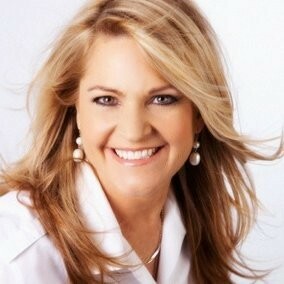 She has helped people create their no more excuses approach to life. She is the principal of UpFront Presentations which helps people figure out how to live on the front row of their life. Her newest books is Is There A Hole In Your Bucket List? : How To Overcome Obstacles That Keep You From Achieving Your Goals. Welcome, Marilyn Sherman. Marilyn Sherman: Thanks Mark, it’s great to be here. Mark S A Smith: I can’t wait to have this conversation. This is the first mindset conversation that we’ve had on the show in a very long time. Let’s start off with why did you choose no more excuses mindset as your area of expertise? Marilyn Sherman: I’ve been studying professional development and success for the last 25, 26 years and I’ve noticed that no matter what industry you are in, whether it’s hospitality, manufacturing, healthcare, direct sales, it doesn’t matter, it all begins with mindset. Out of everything that’s out of your control, the economy, your competition, the weather, whatever is out of your control, the one thing 100% that you have control over is your mindset. All successful people recognize that everything starts with your mindset. Mark S A Smith: Right on. In fact, when I work with my executive coaching clients, the first thing we bang into their heads is solve for mindset first. Mark S A Smith: You can’t do anything until you nail down the mindset. Mark S A Smith: What we’re looking for is a don’t know, can’t do, don’t care. Marilyn Sherman: It’s just a competitive advantage. If you can take a look at your own mindset and know that you are in control of how you see things and how you respond to things and know that there’s a better way to be positive, and to be optimistic, and to positively project your outcome, that’s a competitive advantage. Mark S A Smith: Absolutely true. The difference between leaders and everybody else is leaders have that no-excuses mindset. Marilyn Sherman: Exactly, and I think a lot of people assume that once you reach a certain level of success, that you don’t have fear or you don’t have insecurity or you don’t have obstacles and that’s just simply not true. The most successful leaders out there recognize that it does exist. If they happen to visit that place, they don’t have to live there. Marilyn Sherman: Independently, their answers were, “Oh, I never got over it. I just learned to manage it. I just remind myself that I know what I’m doing and I remind myself that I have value.” So, it’s not something that I achieve, I learned to manage it. I thought that was really insightful. I look at executives and I thought, “Wow, they’ve got it so dialed in. They’ve arrived. They never have that moment of insecurity.” I was wrong. Mark S A Smith: They learned how to manage that insecurity and pass through it. I think its a really important point is that for executives that negative mindset or that impossibility mindset is a transient situation. That moment of doubt is just the opportunity to choose your path once again. It’s a fork in the road, nothing more than that. Mark S A Smith: Versus living in a mindset of victimhood where this is done to me. This is the cause of my demise. Marilyn Sherman: Right. We all have different seats that we sit in. We could choose to sit in the front row where it doesn’t get any better than this. This is the best view in the house. Mark S A Smith: It is the splash zone. Wohoo! Marilyn Sherman: The splash zone if you’re going to the Blue Man group or Disney World or you can sit in general admission where it’s just average. It’s okay. It’s not great. It’s not horrible but it’s not the best. Then people choose to sit in the balcony. The balcony seats, they’re really not engaged. If you look at leaders, they recognize that they’ve got different chairs all over the place. They’ve got the work chair. They’ve got their personal chair, their physical chair, their spiritual chair, the financial chair. The ultimate goal would be to have all of your chairs lined up in the front row, but that’s not reality. The reality is that the chairs are moving all the time. 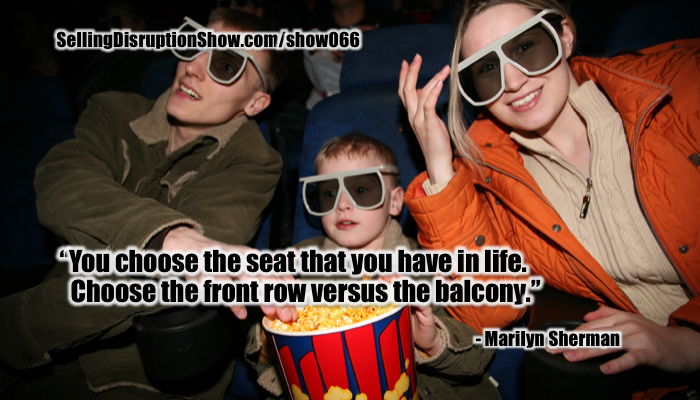 Marilyn Sherman: The key to living a life in the front row is to recognize that you are in control with where you sit. You choose the seat that you are in right now, the relationship you’re in, the body that you’re in, the job that you’re in, the company that you’re in, every single seat that you’re in, you are in that seat because of the choices that you have made up until today. I really love that phrase up until today because no matter where you are and no matter how you’ve been, you can choose to switch it up, because we all have parts of our life, parts of our personality, parts of our habits that we’d like to improve upon, but unfortunately a lot of people claim that which they want to change. For example Mark, we all have someone in our life that’s constantly late. No matter what you set up with them, they show up late. Whether it’s happy hour or lunch or a meeting, they’re going to be late. Marilyn Sherman: When they finally show up, they apologize profusely and they say, “You know me, that’s just the way I am.” I don’t buy into that. That’s not the way you are. That’s the way you choose to be. So, instead of claiming it by saying, “Well, that’s just the way I am. ” say, “Well, up until today, that’s how I’ve been.” That shifts your mindset to being one of I can change the way I am. I can change my habits. I can change my behavior. Mark S A Smith: Right on. You can. You get to choose it and that choice is going to determine where you sit the rest of your life. The thing I really enjoy about this concept of the front row versus the balconies, first of all, you meet the coolest people in the front row. Mark S A Smith: When you go to a show, the coolest people are sitting on the front row. Marilyn Sherman: I’ve met some incredible people in the front row. Mark S A Smith: Versus the people in the balcony, they’re just getting by. If you’re a leader, if you’re running a company, that’s not going to sustain what you want to do. If you want to run a company, you got to move from the balcony to the front row. You don’t get selected to be a leader in which you have front row characteristics. Marilyn Sherman: Exactly. You and I live in Las Vegas. If anybody visits Las Vegas and they go to a show, when at the show, there will always be an usher with two things I guarantee it. That usher will number one have knowledge of all the seats in the house. They know where they all are. Number two, they have a flashlight. They look at your ticket and they say, “Follow me.” They lead you with their flashlight to the most direct path to your seat that’s indicated on your ticket. The ultimate leader, their role I believe is to be an usher. They know where all the seats are. Their job is to know what’s on the ticket of their employee or of their partner. Marilyn Sherman: They say, “Okay, let me illuminate the path. Let me show you the way. Let me light the way with how I act.” Because, sometimes it’s not so direct like this is how you get to your seat. It’s more like, “As a leader, this is how I’m going to behave. This is how I’m going to inspire my people by how I handle conflict, how I handle adversity, how I handle changing the organizations for the better.” That to me is being an usher which is the ultimate front row seat for a leader or an executive. Mark S A Smith: Interesting. Let me show you the best way to the front row seat. We got front and center seats for you. Mark S A Smith: How can a person make permanent adjustments to their mindset, to be disruptive, to have a no more excuses view of the world? Marilyn Sherman: If they just choose to acknowledge that 100% they’re responsible for where they are. As soon as they blame somebody else, they blame their past, they blame the economy, they blame the competition, they blame whenever it is, as soon as they start to blame, they’ve lost it. So, if you acknowledge that I am 100% responsible, that will start to disrupt their past mindset and create a new one. Mark S A Smith: We start with personal responsibility. Mark S A Smith: I really love the idea of admitting to a mistake. Now, keep in mind, if we were in Hollywood right now and we do our lines, what would the director call that? A missed take. What happens in Hollywood when there’s a missed take? Take two! Marilyn Sherman: You do it all over again. Mark S A Smith: Take two, take three. Mark S A Smith: There is this one scene in Spiderman where Peter Parker catches all these things that flew up in the air on a tray and that’s not special effects. He actually did catch those things. It took 57 takes to nail that scene. Mark S A Smith: He made a mistake 56 times. He had to have that innocent look on his face, the 57th time that they did it. The reality is a mistake is really a missed take. “Hey, we blew our lines. Hey, let’s do it again.” That can help us with the disruptive mindset. Take two! Marilyn Sherman: I had a conversation with a leader just the other day that we’re supposed to serving on this pretty important committee. She made a massive mistake. It was such a huge mistake that we had to wait a couple of days before we actually discussed, “Okay, how did that happen?” When I told her to walk me through it how it happened, she went on and on and she overcorrected about how she felt so guilty and it was really horrible. She was looking at the guilt associated with the huge mistake, but my mindset was that mistake was so huge, it’s guaranteed you’re not going to make it again. Mark S A Smith: Right on. That’s one of those don’t know can’t do don’t care situations where we’re missing a piece of information. Did we physically not have the resources to take care of the situation or is it that it’s just not a priority? Mark S A Smith: That for me was a great big aha because I was trained to absolutely avoid making errors, to avoid mistakes and here this guy was doing something intentionally to see what would happen. You have to be aware that your millennial buyers are going to intentionally break the system, because that’s what video games are all about. It’s about doing things you don’t expect. If you follow the linear route, you’ll never win the game. You have to try things that seem outrageous and unreasonable. So, we’re getting the shift from absolutely do it perfectly to let’s experiment. Let’s have a hypothesis. Let’s see what’s going on and so the mistake becomes intentional knowing that few mistakes are lethal and few mistakes are permanent. I think that can also add to this disruptive mindset. In fact, disruptors are going to do a lot of things badly wrongly misjudged by those that they’re disrupting. Marilyn Sherman: My mentor Dr. Nido Qubein you know him as the president of High Point University, one of the most successful people I know and the board of directors of several large organizations like BB&T and La-Z-Boy furniture. Mark S A Smith: That’s right. Came to the country, couldn’t speak the language, penniless. Marilyn Sherman: So, as a leader, when we have these millennials that are making mistakes or if we have a team that makes mistake or if we’re not going the direction that we want only or we tried something and it didn’t work, the difference between being disappointed and being discouraged is disappointed is we didn’t meet the expectations that we set out for ourselves or an employee didn’t live up to their expectations. Being disappointed is “Okay, it didn’t work. Let’s adjust. Let’s regroup. Let’s change.” Being discouraged, it’s like, “Oh it didn’t work. I don’t know what to do.” The differences may seem minor but I think the difference is hope. When you are discouraged, it’s as if you don’t have hope that things are going to get better. Mark S A Smith: Keep in mind that all executives create a future that does not yet exist using methods that have yet not been invented. So, as we proceed on this path into the unknown, it’s not going to work out because we don’t have a clear path. Mark S A Smith: So, the path is invented as we proceed. Sure, we’re going to have disappointments along the way. It’s going to happen. Over my shoulder is a picture of Thomas Edison, love him or hate him, he was the most prolific inventor on the planet. He’s not been outstripped as an individual. He made hundreds of thousands of mistakes in his attempt to create what we now know as motion pictures and music recording and electric light bulbs and ultimately electronics. So, he made a career out of making mistake after mistake after mistake because he was inventing a future that didn’t yet exist. 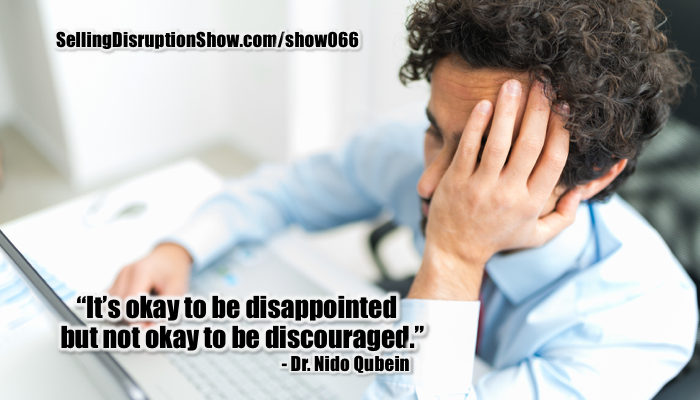 This concept of don’t be discouraged, disappointment is fine. It didn’t work out, oh well, next. As leaders we must have this mindset of we are forging into the unknown and when you don’t know you’re going to be disappointed but without that expectation, you’re not going to take the step. Marilyn Sherman: Remember that the most successful leaders out there recognize that they don’t have all the answers, but they never stop asking the right question. Even a question of who do I need to talk to about this, what resources do we need, who can we bring into this, what am I not knowing, what questions should I be asking. I think one of my favorite questions especially when I’m talking to people that are smarter than I am, I could be insecure about it and act like I know what I’m talking about or I could be like I know my lane and your lane is different than mine. I really want to learn about your lane. What question have I not asked you? Mark S A Smith: Yeah, especially an expert. Marilyn Sherman: That’s what makes them the expert. Mark S A Smith: That’s right. The difference between a consultant, everybody else’s consultants know what questions should be asked. I have got my list, as a consultant, my job is to ask a lot of questions. It’s not to have the answers but to have the questions. Beautiful. Let’s just shift this conversation to your new book Is There A Hole In Your Bucket List? : How To Overcome Obstacles That Keep You From Achieving Your Goals. What is the hole in most people’s bucket list? Marilyn Sherman: Let me just paint a picture for your listeners. Everybody has heard of a bucket list, the list of things you want to do before you literally kick the bucket. Some people have a goal lit. Some people have a life list. I call it a bucket list. Unfortunately, people don’t fulfill things on their bucket list and what they don’t realize is that there’s a hole in their bucket list. Some people have multiple holes in their bucket list. Picture literally a bucket that’s filled with all of your dreams, your hopes, your aspirations but those dreams are not coming true. They’re not being fulfilled. If you look closely you’ll notice that your bucket has a leak in it, that leak is created picture little nails that have created holes in your bucket and those nails are called fear, doubt, comparison to others, insecurity and shame. Marilyn Sherman: So, all of these things cumulatively or individually are causing you to stumble along the path to fulfilling your goal. My intention is to help people recognize that they’re not permanent holes in your bucket list. You can patch those holes with kindness, with compassion, with acceptance, with learning and growing and acknowledging that this is where you are but this isn’t where you want to be eventually. I wrote this book out of my own failures. Isn’t it how disruptive thought happens is you have a failure and you’re forced to look at how you failed and then all of a sudden you’ve got a new idea, a new mind shift, a new process, a new book? Marilyn Sherman: So, what happened was my father who was my hero passed away. We were very, very close. He was such an inspiration. He’s the one that taught me how leaders think differently and how you have to be outrageous with your goals and you have to have tenacity in your life. You have to go for it. He would come you go to go for the throat and I was an athlete. That’s what made me a successful athlete is because he told me to be tenacious with my competition to go for the throat. My dad passed away. I have a year of grieving any a year of being off my game. I literally woke up a year to the day that he died and I just happen to weigh myself, because I noticed my clothes weren’t fitting as comfortably as they had in the past. I looked at the number on the scale and in one year I had put on 34 pounds. Marilyn Sherman: All of my research came in about how people … they’re not either insecure or not insecure. Everybody has that little sliver of insecurity, some is bigger than others, they just manage it differently. So, I talk about how you manage insecurity, how you overcome fear, how you have doubt in your doubts and faith in your faith. All of these solutions to patch those holes. In this writing process because I was so vulnerable and so honest, I lost the weight that I had gained. So, it was like a nice byproduct of writing this book. Mark S A Smith: Indeed. In my experience is that weight reflects our internal state of mind and when we shed our internal load, the body follows suit. Marilyn Sherman: Exactly. It’s like when someone gives you bad news. In your mind you can say, “Great!” because your mind will then say, “Well, wait, what’s great about it?” You get to the learning much quicker. Mark S A Smith: That’s right. Instead of paying on to the past, to create disruption, we are going to go through confusion because confusion always precedes clarity. Mark S A Smith: Then it’s okay to be disappointed but not okay to be discouraged. That’s a really beautiful thing. Marilyn Sherman: I think if you just recognize that where you are is because of the choices you’ve made up until today. Everything you and I do and everything we think about and everything we react to is based on choice. I wrote a book called Who’s Comfort Zone Are You In? many, many years ago and I wrote Choices as an acronym as choosing healthy options increases chances of excellence and success. Marilyn Sherman: I’ve burn that into my brain is that we all have choices. Every single day we have choices. So, once you decide what your front row is for you, then you can make a choice to say, “Okay, what can I do to move myself closer to the front row?” So, if you don’t like where you’re sitting, move. Mark S A Smith: Get up, move. Marilyn Sherman: Get up, move. Mark S A Smith: That’s it. How do people get ahold of you? Marilyn Sherman: I have a website marilynsherman.com. That’s the best place to come check me out. I’ve got some free YouTube videos on there. I’ve got my books. If anybody wanted to order a copy of my book, they can do to it it’s in my website are amazon.com. Mark S A Smith: Excellent. Is There A Hole In Your Bucket List, you can get that from marilynsherman.com. Keep in mind Marilyn is a keynote speaker. She works with corporations large and small to improve mindset for the executives and the team. Thanks for being on the show. Marilyn Sherman: Thanks Mark. It was great to be here with you.